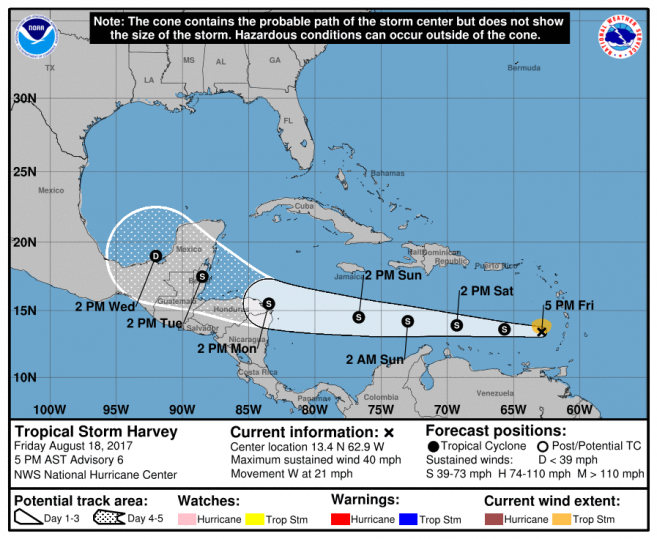 for Belize is Tropical Storm Harvey.  The public is hereby advised to make some preparations to protect life and property. If you are at risk to bad weather and flooding make arrangements for the next week you will move away from the coast to higher grounds. If you have to seek shelter next week, know which shelter you will go to. Prepare how you will reach to your shelter. Check on family members and neighbors who may be in need of assistance. On the current projection for TS Harvey, the window of opportunity to relocate from coastal areas will be next Monday evening August 21st, 2017.  Enjoy your weekend but take precaution and start your preparations. It is not expected that TS Harvey will affect the country over the weekend. Stay calm, this is just an alert.  Drivers are always reminded to drive with extreme caution.  Toledo, Mr. Kenton Parham at 630 9787.  The NEMO Emergency Hotline is 936. NEMO IS ON ALERT BUT NOT ACTIVATED. 2018 Atlantic Hurricane Season at its peak; be prepared!